Not everyone will understand you. Not everyone will like you. Did you know that it’s okay? Why is it that we think we should be liked by everyone when Jesus himself wasn’t? We are certainly no better than he is yet we all fall into this no matter how hard we try not to. I’ve done a good job most of my life pretending I don’t care if people like me or not, but let’s face it, it’s in our human nature to want to be liked. 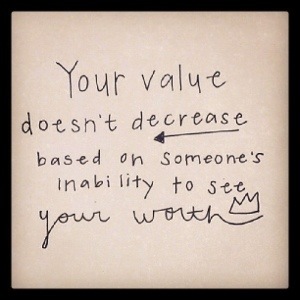 Don’t allow someone else to determine your value. Your worth is so much greater than you can even imagine. You are worth so much that Jesus chose – CHOSE I say – to die in order to spend forever with YOU. What’s cool is you may not even know him yet, but he knows you and loves you and KNOWS you were worth every second of it! And if he had it to do all over again, he would do it. So when that boyfriend starts talking to another girl or tells you something you need to change about yourself, or when the girls say hurtful things about you on Facebook, just remember that they don’t determine your value. It means they haven’t looked beyond themselves to see your worth. Im an Uruguayan girl, that’s in love with your blog. i find it so interesting and amazing! I was wondering if there was any possibility you could advice me about being a spanish teaches; i’ve been thinking about it, and as far as i know, there are plenty of job opportunities in the US, and they earn pretty well. I hope to get a reply soon! I’m not really sure what advice you need, but I will say of you feel called to teach then go for it! !